Boss Mark Hume is challenging his Matlock Town side to improve their form against the league’s struggling sides. The Gladiators suffered a shock home defeat to Stamford last weekend, which followed a recent surprise away loss at Grantham. Matlock have also only drawn at home to Colwyn Bay and been beaten at Skelmersdale and Mickleover, who are below them in the league table. Hume’s men travel to second-bottom Whitby at the weekedn knowing they have to put things right. Hume said: “I make it eight or nine points we’ve dropped against lesser sides and you add that on to our points total and we’d be in the top six or so in the league. “We went to Nantwich and, after a nightmare first five minutes, we got back into the game and were probably the better side for the last 85 minutes. “Then we get that poor performance on Saturday, but even then we ought to have won comfortably. Apart from me and Maxi (Scott Maxfield) going on to put the ball in the net ourselves there wasn’t much more either of us could do. “We want them to go up there and to Salford and play like they did at Nantwich. I asked them if they were conning me after the game on Saturday as I couldn’t understand the difference in the performance level from the midweek game. “We don’t want them to go there with any sense of pressure, they need to relax and play like they’re capable of. Matlock have managed only six goals in nine home league and cup matches so far this term and Hume said the Stamford defeat had put him in a bad mood for days. “I’ve been like a bear with a sore head and the players knew it at training on Tuesday,” he said. “Certain chances we missed were unforgiveable, if we could have taken one or two of them they (Stamford) would have buckled, but they were still in the game and we get done from a set piece, which to be fair we said was the only way they’d score past us. “We’ve got to get into the mentality of destroying these lesser sides. Their goalkeeper’s done well but with some he was nowhere near. “We said it a week or two ago, we can’t go on missing chances and the lads know that if this continues somebody else will be brought in to step into their shoes. Hume is currently working hard to bring in a couple of attacking players, plus another defender, although he believes it will be unlikely that the squad will be added to before the trip to the Yorkshire coast. 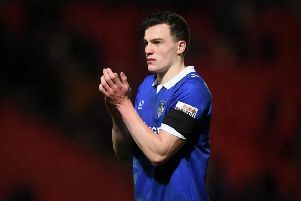 He has though sent loanees Jordan Deacey and Jason Paling back to Boston United and Alfreton Town respectively now that their one month deals have expired. Matlock have an opportunity to record their second league double of the campaign after a late Niall McManus strike gave them all three points at the Autoworld Arena in August.